Training tailored to you and your individual dog. Take a look at what my clientele have to say. View the training methods I use on a daily basis with my clients. 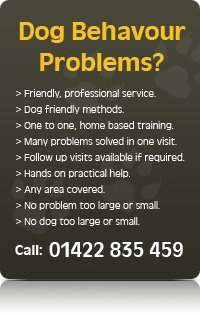 Contact us today to get your dogs trained straight away. AB Dog Training is a specialist service provided by Alan Beaumont, canine co-operation through canine communication, for a dog friendly approach to be a happy and obedient dog. Building the lifelong bond between you and your dog no matter how small they are! Building the lifelong bond between you and your dog no matter how large they are! Thanks for visiting ab-dogtraining.co.uk! 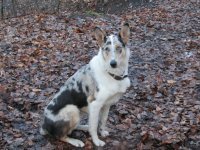 The website that will give you the information you need to choose the dog trainer with a lifetime's experience of dogs and a friendly, professional approach to dog training. I am a behavioural dog trainer based near Halifax in west Yorkshire who works across the north of England (and beyond) to help you with your dog behaviour problems. I offer a one to one, home based service that is tailored to you and your dog. I will provide you with all the hands on help and information you need to resolve any existing behaviour problems or simply to ensure you start in the correct way with your new dog or puppy. Owning a dog should be a pleasure for both you and your dog. A badly behaved dog is usually a sign of a highly stressed dog and a highly stressed owner! By resolving any behaviour issues, a state of calm and happiness can be returned to your home! All my training is carried out on a one to one basis in your home and I have worked from Bridlington in the east to the Isle Of Man in the west, from Newcastle in the north to southern Portugal in the south, so if you are looking for dog training in Halifax, Huddersfield, Leeds, Bradford, Burnley, Yorkshire or indeed any area beyond, please don't hesitate to call me 01422 835459 or e-mail happydog-1@hotmail.com.